The only Brazilian company in the segment to be ISO 9001: 2015 certified, Grupo Polar specializes in the development of specific solutions that guarantee the thermal integrity of the product during transportation and storage. With almost 20 years of experience, our goal is to disseminate knowledge in order to improve logistics and processes throughout the Cold Chain in Brazil and worldwide. During the preparation process of a medicinal product, it is necessary to set the storage and preservation temperature so that its characteristics are maintained with quality and the therapeutic effects achieved effectively. Transport is undoubtedly the biggest challenge of the whole life of this product category, since the variables that make up cargo logistics – such as the ambient temperature and the tropicality of a country with dimensions such as Brazil – translate even more the efforts which must be applied to the file. Aware of the needs and bottlenecks of this segment, Grupo Polar develops studies and continually invests in research and development (R & D) to provide intelligent and customized solutions that meet the needs of the pharmaceutical, logistics and laboratory industries in order to guarantee product integrity and the safety of the entire cold chain regardless of the temperature range. In order to support the expansion and constant search for innovation, the new headquarters of Grupo Polar, located in São Bernardo do Campo, has more than 6 thousand square meters and houses the entire production line, the Research and Development Department, the Thermal Laboratory and Packaging Division. Accompanying and promoting the development of the Cold Chain is part of the DNA of Grupo Polar. Therefore, it has created a department destined to look for innovations and robust solutions that can be applied to the reality of Brazil and Latin America and meet the global requirements of the pharmaceutical industry. After becoming a reference in Cold Chain in Brazil, Grupo Polar takes new flights and offers the entire range of Polar Tecnica products and know-how in Colombia, Chile, Argentina, Peru and Panamá. Taking a further step towards the future of the Cold Chain, the Grupo Polar presents to the Market an artificial intelligence platform (A.I.) applied to the active and intensive management of temperature and humidity. Recognition of the relevance of the event and the topics discussed for the national market, with the participation of representatives of Anvisa, Sindusfarma and international companies and regulators such as DuPont ™, CECMED and BioCen. Grupo Polar revolutionizes and creates a new concept in thermal packaging for transporting thermosensitive products. 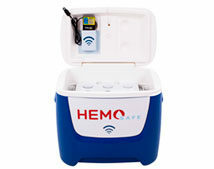 Hemo Safe Pro is a compact refrigerated transportation solution with complete and efficient monitoring, tracking, alerting and reporting of the information obtained during the logistic process. The first virtual store in Brazil to sell all thermal solutions directly to the end consumer offers the entire line of qualified thermal bags with differentiated design and reusable ice available in an uncomplicated and fast way. Customizable solution capable of monitoring in real time the positioning and the internal temperature of the containers for thermosensitive products during transportation, an innovation that represents an economy of approximately 100% of the losses connected to the temperature excursion during the logistic process. For the third time, Polar Técnica is a winner in the category of Service Providers – Cold Chain Solutions. The Award is an action of Sindusfarma, which for 20 years monitors and awards the best suppliers and service providers of the pharmaceutical industry. Grupo Polar becomes the official distributor in Brazil of the DuPont ™ Tyvek® Air Cargo Covers, also known as pallet blanket. Polar Técnica is the only company in the segment to carry out the quality control on processes and products, according to the 2015 version of ISO 9001. Aiming at the best operational and logistical cost-benefit of its customers , the Grupo Polar creates the Packaging Division and offers the most complete and intelligent thermal solutions for transportation. Developed and manufactured by the Grupo Polar, the packages meet the thermal profiles of ISTA 7D, AFNOR, among others. With the aim of offering different strategic possibilities for temperature monitoring and tracking, the Grupo Polar consolidates international technological partnerships, as well as developing its own solutions that combine market knowledge with the available Technologies. The continuous search for the best intelligent thermal solutions and technical support has allowed Valida to expand its activities and develop the qualification of equipment and environments, thus offering consultancy for the whole chain (production, storage and transport). Inauguration of the first laboratory in the country specialized exclusively in qualification and thermal testing of packaging. Located in the city of São Bernardo do Campo (SP), it has a highly qualified technical team and is inserted in the most relevant and important discussion groups on Cold Chain, besides being a reference for practical and theoretical contributions in the segment. Ecological awareness and well-being of future generations are part of Grupo Polar’s values. Precisely for this reason, foams of the Ice Foam™ line are completely non-toxic, biodegradable and with a 100% water filtration and reuse system throughout the production process. Taking into account the new demands and needs of the national pharmaceutical industry ,the Grupo Polar develops thermal elements with exclusive technology, such as Thermo Control and Super Cold. Grupo Polar specializes in developing specific thermal solutions with unique technology to ensure the integrity of temperature sensitive products during transportation and storage, whether they are 2 ° C to 8 ° C | 15 ° C to 25 ° C | 2 ° C to 25 ° C | negative. Developed to maintain low temperatures for a long time , the Techgel is composed of Acrylic Polymer based gel, which gives different properties of similar products, revolutionizing the Market. Cibragel has come up with the aim of offering thermal solutions for transporting products at low temperatures , in less complex chains, with exclusive prices and the same safety, quality and reliability that only the Grupo Polar offers. The first ice of Brazil is the result of a market analysis that pointed out the difference between the enormous resources allocated for the development of pharmaceuticals and the inadequate cold chain management solution. The pioneering status of Ice Foam™ was quickly recognized, making it the most widely used product among pharmaceutical companies in Brazil. A pioneer company in the manufacture of thermal elements and research development in Cold Chain , becoming in future the Grupo Polar’s link. Polar Técnica has revolutionized the pharmaceutical market as the first company in Brazil to invest in research development and customized solutions in Cold Chain. The launch of Ice Foam™ – unique technology that has resulted in a reusable non-toxic thermal element with improved thermal stability and autonomy – is the result of ongoing dialogue with pharmaceutical companies. Due to its competence and values, Polar Técnica has become a benchmark in the market and, since its inauguration, its objective is to offer customers complete solutions in all links of Cold Chain. This was the origin of the Grupo Polar, the vertical integration of the services provided by the companies Polar Técnica, Cibragel, Valida and Polar Store. With nearly 20 years of experience and technical competence, the Grupo Polar is a pioneer in the development of thermal elements (ice) and operates with the manufacture of boxes, thermal bags, dataloggers, trackers and temperature monitors, including qualification, validation and testing services mechanical, for the best performance of thermal packaging, equipment and environments.